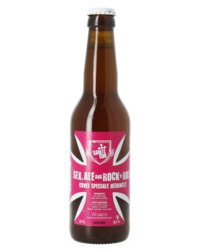 The young Alsatian Brewery, Sainte-Cru, officially exists since 2012-2013. Even though one must know that their work started a few years beforehand, starting their brewing experience as amateurs, producing 20L and then 100L for each of the 60 recipes. In the beginning they were simple beer drinkers and in love with this beverage, but they were missing something during their tastings: out of the ordinary, powerful and distinctive flavours. It was when they had the opportunity to taste a Scottish beer from Brewdog: the Punk IPA. It introduced them to a more diverse and better beer environment, more particularly, to the American hops, their main inspiration. 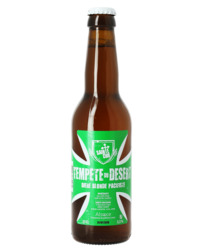 Their production, then increased from 100L to 600L, allowing them to officially present the brewery's first beer: «La Tempête du desert », a Pale Ale rich with hops. In 2013, the contratian and independent brewery, with catchy names and meticulous designs, settled in Colmar in their brand new premises, that offered them the opportunity to double their production in a period of two years, reaching 1500hL in 2015, then 3000hL in 2016. The Sainte-Cru's main motivation is to always push even further innovation, imagination, and differentiation of their products, all while maintaining an exceptional quality and originality. Among the brewery's beers you can find flavourful beers such as the Antisociale (an anarcho-mutualist Black IPA), the White Rabbit (a nihilist white beer) and the Orange Mecanique (a satiric beer flavoured with acacia honey). To conclude, a muste-taste French brewery!